Greenway 2020 artist rendering courtesy of Lean Arch, 2014. This week we are eager to announce the release of our 2020 IPA, the latest brand in our custom IPA series. Brewed with the Greenway 2020 river project in mind, this red IPA clocks in at 7.4% abv and is a unique offering in our hop-forward custom lineup. 2020 IPA features an interesting combination of hops including Warrior, Palisade, Cascade, Chinook, Simcoe and Ahtanum. This is our first beer featuring the relatively unknown Ahtanum hop varietal which has characteristics that mimic the citrus and floral notes of Cascade and the piney, earthiness of Chinook. The result is a medium-malt bodied red IPA with citrus and pine notes, a slightly tropical twist, and a west coast-style bitterness. This beer was created in partnership with the Los Angeles River Revitalization Corportation (LA River Corp) to help raise awareness for their Greenway 2020 Project. Greenway 2020 will breathe life back into a 51-mile stretch of the LA River by revitalizing public spaces, encouraging local businesses, and maintaining the waterway. Seeing as though the river is practically in our back yard, our team was excited to collaborate with this organization which hopes to complete their project by the year 2020. The art on our can design was created by our friends at Lean Arch and is a representation of the project’s futuristic renderings. 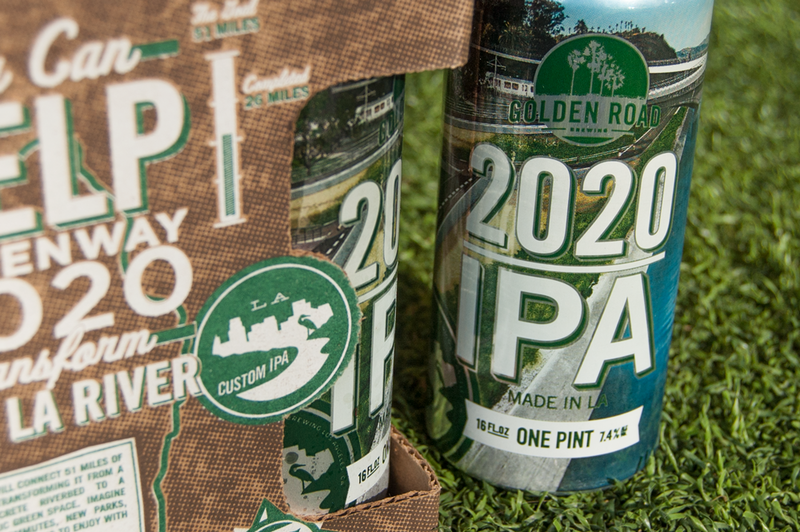 Cans of 2020 IPA will hit retail locations starting February 1st and will be available in cans and on draught at The Pub at Golden Road starting Thursday, January 30th at 5p.m. $1 of every pint and 4-pack sold at The Pub will directly benefit the LA River Corp. For more information on the Greenway 2020 Project, click here.